Robert L. “Bob” Tilles (1920–1976) served as Professor of Percussion and Head of the Percussion Department at DePaul University in Chicago for the last 16 years of his life. Tilles’ professional performing career included positions with the 346th Army Service Force Band during WWII and as a staff musician for CBS television and radio studios. He performed and recorded with such entertainers as Bing Crosby, Bob Hope, Frank Sinatra, Dean Martin, Sammy Davis, Jr., Nat “King” Cole, Dizzy Gillespie, Duke Ellington, and Louis Armstrong. In addition, he could be seen and heard on the Ed Sullivan, Arthur Godfrey, and Merv Griffin TV shows. A student of Roy C. Knapp, Tilles taught at the Knapp School for Percussion prior to joining the faculty at DePaul. Tilles was active during the founding years of PASThe Percussive Arts Society is a music service organization whose mission is to inspire, educa... More as a board member and contributing editor, and he served as host of the first PAS Day of Percussion in 1971. 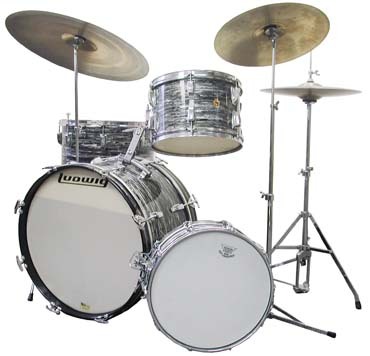 Bob Tilles’ Oyster Black Pearl “Classic” four-piece drumset from Ludwig is similar to the one made famous by Ringo Starr. 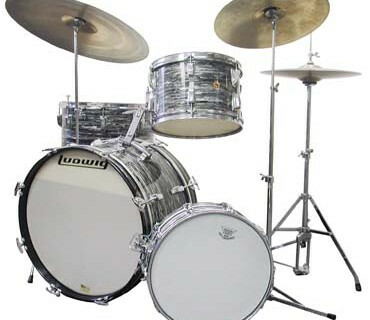 This drumset features a 14 x 20 bass drumThe lowest pitched drum in a marching band or with a drum set. A two-headed drum, it is usually..., 16 x 16 floor tomGenerally the deepest tom on a standard drum set. 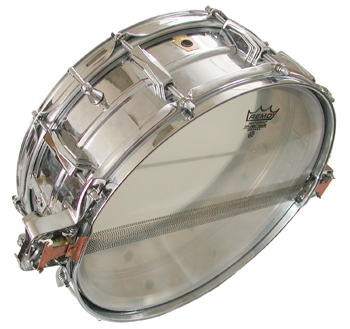 It sits upright on 3 legs., 8 x 12 hanging tom, and a 5 x 14 “Super Sensitive” chrome-plated snare drumOne of the more common drums in marching bands and drumlines and the primary drum of a drum set.... Both toms have WFL “keystone” badges and are stamped inside with the date Sept 30, 1958. The bass drumA hollow cylindrical shell of any size that has a head stretched over one or both ends and is b... has a Ludwig keystone badge (with no serial number) and is stamped inside with the date Oct 8, 1962. The snare has a Ludwig keystone badge with serial number 4437, which suggests a 1963 date of manufacture. This date is supported by the P-4067 “baseball bat” tone control with red felt. All were likely purchased at the same time as a complete set in 1963. Hardware on the bass drum features the P-1672 bracket on a No. 782 “Clipper” mount for the 12-inch tom, a cymbalA copper/bronze (or variation of metal alloy) disk struck with a drumstick or crashed together ... mount, and spur locks. Additional hardware includes a Ludwig Speed King bass drum pedalThe pedal used to play the bass drum on a drum set. with both wood and felt beaters, a No. 1400 cymbal stand, and a No. 1124 Atlas hi-hatA piece of the drum set, consisting of two cymbals mounted on a stand. The cymbals are opened a... stand. Cymbals included with the set are a pair of 14-inch Paiste Formula 602 hi-hats, a 22-inch Zildjian medium ride, an 18-inch Zildjian ride, and a pair of 16-inch hi-hat cymbals of unknown make.